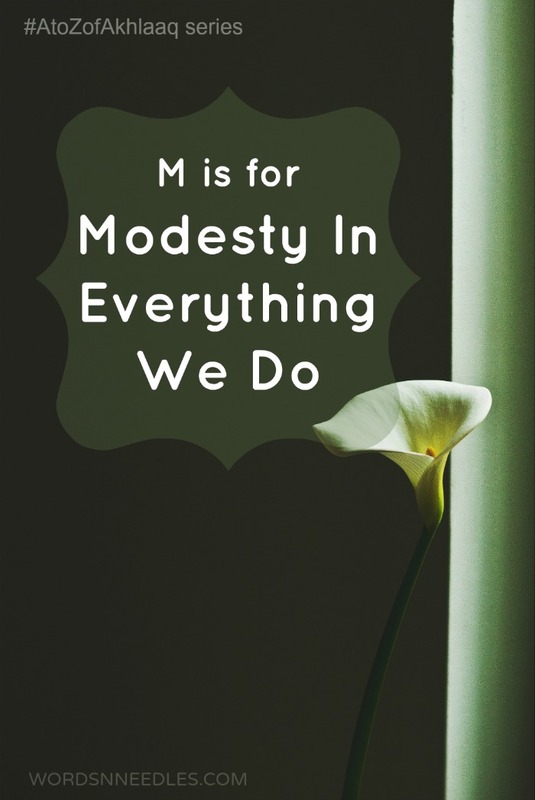 We talked about M is for Modesty today as part of the #AtoZofAkhlaaq series that we are doing every day this month. 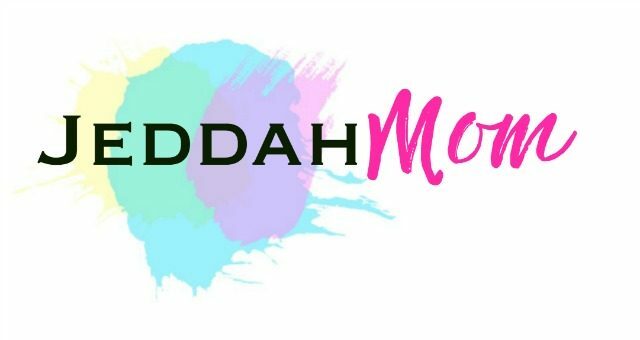 My kids learnt the meaning of the word Modest and the three types of modesty that there is: Modesty in dressing, modesty in talk and modesty in living. I discussed with them the different ways we can have modesty in everything we do. My 7 year old didn’t know the meaning of the word. Modesty, I told him, is to live in moderation. It means to ‘not show off, dress improperly or live extravagantly’. To explain further, I told him that it means to live in such a way as you don’t give up your sense of shame or have too much pride and arrogance. When people showoff, boast or talk too high of themselves, it usually is out of feeling proud or wanting attention. When someone talks shamelessly, as in swearing or talking extravagantly, it is again to either influence the other person or to insult them. Dressing immodestly is also something similar. We all want to look good but when you overdo it and end up looking shameful (as in not properly covering yourself), this is not right. The Prophet (PBUH) called the person who is fahash to do what he likes. (meaning to say he isn’t amongst us). The word fahash is used to talk about immodesty. My son, couldn’t relate better to it until I started talking to my three year old daughter about it. She was a wearing a sleeveless frock. She is a very modest and self conscious little girl MashaAllah and she often wears leggings with her frocks. She also likes to pull on a jacket when she is out and about. I asked her why she doesn’t like wearing shorts with frocks. She replied that it was because her legs would be bare and she felt ‘shame-shame’ when her legs show. She also doesn’t like her frock flaying when she went out. We talked about how grown up ladies cover up when they go out and how it is instructed for older girls to cover their hair too. My son hadn’t known why some older girls wear only the hijab and not the abaya. I told him that girls start covering their hair from when they are 7yrs old but when they get over 12yrs, they start wearing the abaya over their dresses. He wanted to know if men covered themselves too. I asked him if he noticed any difference in his dad or relatives. He hadn’t seen any. Yes, they don’t cover up but they do practice modesty. As in, Muslim men don’t talk to ladies unnecessarily and they don’t sit with ladies even when they go visiting. I took this opportunity to tell them how it was immodest to stare at others too. We also talked about what it meant to talk modestly. As with all 7 year olds going to school, they love to repeat bad words. My son had heard a word at school that he was shocked and amused at the same time. At first, he was shocked that the boys could be so shameful. After a few days, he used it once to joke. I told him that he couldn’t use that word in our home. He stopped then to use it again a few weeks later. It was funny that I asked him if he would eat with that mouth because that really shut him up like I had something shocking. He never repeated the word again. Today, while we were talking about modesty, I brought this topic up. I told him how it felt when you first heard that word. He said it felt really bad. I gave him words to use by asking him if he would use the words dishonouring, shameful and shocking. I also asked him if he were sitting in a gathering of really good people, would you like it if someone used that word. This really made sense. Anything that you say which makes you feel like you wouldn’t say in good company or things that make you feel ashamed to repeat should not be said. I told him that it isn’t just about talking but also about your thoughts. Did you think something that if someone heard or saw would make you ashamed? That isn’t right too. He was really prompt to give example by saying that like watching violence on TV. Spot on!! How to teach little children modesty. Instil in them the fear of God. A child should know that he is being watched and will be taken account for all his doing. From the parenting point of view, this is called as setting limits. A child who is without limits will grow up to be enslaved by his life. He will not understand why he shouldn’t do something at all. So to make them understand why they shouldn’t do something, teach them why it is wrong and what happens when they are caught being bad. Instil in them the love of God: Have you seen how very little children always try to please their parents? They want positive attention. They want mommy and daddy to love them and usually they will come running after doing something to see if you approve of what they have done. Very similarly, a child who is taught from the very beginning that God loves him and gives him all what he wants, will grow up to want to adhere to the Right Path. Show them from when they are small to notice the little blessings that they have and how they are being rewarded for all the good things that they do. Talk to them about how being good makes them feel good too. Practice what you preach. Kids love to copy their adults. They will want to talk like you, dress like you and be mini you so as much as you can try to be a good example. I have an example to narrate here: When we small, once we were going in the car and a rash driver came from the opposite side narrowly missing us. My father was driving with is window down and he put out his hand and yelled at him to be careful. A few minutes later, another car came the same way. My father didn’t say anything at him but my little brother, who must have been a little more than a year old, quickly bounced in his seat waving his hand and started yelling! It wasn’t even a bad word that my dad had used but he copied it! Do you have something similar to narrate? What to do about a child who potty talks? No matter how good we are and how clean we try to keep our language at home, a child will pick up words from outside. Sorry to say this if you are a first time parent reading this but really, that is the truth. How you react to them when they use bad words is what will decide if they will use it again. Believe it or not, your child is watching your reaction. He wants to see what impact that word has. He has no idea what it means (most of the time) but he loves the effect it has on the person who he has used it against or who has heard him. It is like a little ‘power’ word. He uses it and BAM! People take notice. Isn’t that a fantastic way to get attention? It is like his little magic spell. So what do you do? Firstly, don’t give him that attention. Don’t let him feel that that word had that effect on you. Instead, tell him, very calmly, that you will not allow that word in your home. (You are showing your authority.) Next time, he uses the word (There will be a next time! ), calmly show your displeasure by asking him if he will use that mouth to eat his food. (I don’t know why it is so but I have found that that is the only sentence that stops them in the tracks!) Don’t give any undue attention to the word again. Don’t press the matter for now but if it happens again, you will have to be a little strict. My way is to usually tell them to go make Wudhu. They don’t repeat it again. (So far, my experience is that they don’t repeat it again.) If they do again, keep asking them to make wudhu. If it becomes a habit, you may have to talk to them to see what is bothering them because this could signal a bigger problem. What to do about a child who loves to show off: If he is small, entertain them. 🙂 No really. Children love to make up stories. They have a very active imagination and once they have done something extra ordinary they will want to talk about it. Most of us encourage our children by saying something good, listening their whole story and congratulating them. Unfortunately, there are some of us who fail to see that the child is asking for appreciation and attention. We talk them down. Tell them ‘yes, yes we have heard it’ and end of it. Kids like this have to try harder to make themselves heard or acknowledged. They make up stories and adventures where there aren’t. The best way to handle this is to stop and listen to the child. Give them their due attention. If he has been lying and you know of it. Tell them that it is wrong to lie and make up stories. Talk to them about trust. Keep your talk short and don’t make a deal out of it. Your purpose is to tell them that they shouldn’t lie and the consequence it has on them. Once you have said that, leave that matter but keep yourself alert for all the good that they really do. Catch them being good or telling the truth. Catch them when they are minding their manners or any other quality in them. Show your appreciation then. Tell them how you liked that they put their toys away or how they put their shoes back. Tell them how you admire them for their Lego skills or if you have a girl then talk about her skills. Once your child sees that you do admire them for the qualities they really have, they will stop faking it. Teaching children to live within their means: This is a very important lesson in life that we should all practice. One of the best ways to teach children to live without extravagance is to show them what money can buy and cannot. It also helps to show them what they have compared to other. Teach them charity. Teach them to have gratitude too. When we were doing the letter D, I talked to my kids about giving away an old toy for every new one. This is a lesson that teaches children to be realistic about their needs too. This post has been long…! I can go on writing.. 🙂 As we all know, teaching children about modesty doesn’t come easy. As with all manners, we need to keep on repeating our lessons till they become habits. May the Almighty guide us in becoming better parents. Ameen. If this your first time here, do hop on and read about rest of the stories and lessons in the series. This post is part of the A-Z of Akhlaaq series. Follow us on Facebook for more ideas to teach your child or for just some fun. You can also subscribe to our newsletter to be notified of future posts.